Twenty-one year old Nigerian Chineye Okoro Onu has a passion for art, the environment and inspiring change through employment in West Africa. She is the co-founder of the Mosaic Inspiration Project, an initiative she launched while studying human resources management at Radford University College in Accra, Ghana. 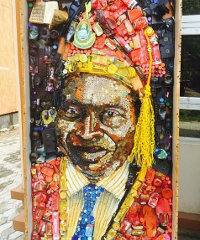 The start-up brings together struggling artists to produce creative pieces from recycled material, such as plastic and polythene waste. Mosaic Inspiration Project’s signature artworks are paintings and mosaics of people who have brought positive change to the world. The aim is to empower young artists with entrepreneurial skills and training, who then generate a monthly income off the sale of art and exhibitions. The project’s signature artworks are paintings and mosaics of people who have brought positive change to the world. Last year she was named one of the 12 finalists for the Anzisha Prize, a pan-African competition for entrepreneurs aged between 15 and 22. As we all know every business has its own risks and challenges, but our business is lacking in a lot of areas and those have produced risks for us. For example, health and safety is one of the key employee rights that need to be provided in every business. The nature of our work is dealing with waste materials from trash bins and dumpsters, so we are prone to certain diseases harmful to health. As a start-up, we do not yet have proper health and safety insurance. Inadequate finances and lack of support from external sources is also one of our biggest risks. If we are not able to run the business consistently, and lack the right mentorship, then we won’t be able to pay salaries, or efficiently direct our time, money and resources towards growing our business. Social media and directly approaching individuals and organisations. If you were given US$1m to invest in your company today, where would it go? If I was given $1m it would be a dream come true. I would be able to better facilitate the production process of the company products by acquiring much needed machinery, additional labour, and build up our own production site. This would create a more conducive environment for working, educating and training our employees on the technical expertise of our project and allow us to scale our business more effectively. What has been your biggest mistake, and what have you learnt from it? One was taking certain things for granted and almost giving up on my dreams because of a [financial] situation I found myself in. But as an entrepreneur you need to be able to think outside the box. If you think you are losing focus, take a deep breath and try again. And be creative. In line with the old saying: ‘If life throws you a lemon, why don’t you start up a lemonade factory?’ The most important lesson I have learnt is to never give up. Definitely being featured on media platforms such as CNN, CCTV Africa and Al Jazeera as one of the 12 finalists at the Anzisha Prize. I felt so blessed and like I could help change the world and inspire young people like me to never give up on their dreams. What is the best advice you have ever received and would like to pass on to other young entrepreneurs? I must say, those words keep ringing in my head every day of my life.